On a clear and appropriately sunny Southern California day, the Calit2 courtyard yesterday provided a picturesque setting for a formal announcement that many at UC Irvine had been anticipating eagerly. U.S. Deputy Secretary of Energy Daniel Poneman announced that a UCI-led team of four Orange County colleges and universities was one of 20 chosen to design and build a solar-powered house for the national 2015 Solar Decathlon. “Team Orange” also includes Chapman University, Irvine Valley College and Saddleback College. In addition, Poneman revealed that Orange County’s Great Park will host the October competition for the second consecutive time. The biannual challenge took place at the Great Park last year, the first time it had moved from its original venue on the Mall in Washington, D.C.
“This is a great day,” Poneman said after stepping to the microphone with a resounding and well-received “Go Anteaters! He credited former Secretary of Energy Stephen Chu with creating the Solar Decathlon, saying Chu had challenged America to make solar energy commercially viable and competitive within a decade. The strategy appears to be working; the competition, which has spawned Solar Decathlons abroad, has already resulted in several commercially available home-energy-management technologies. 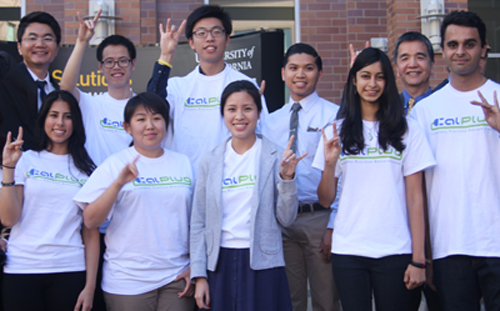 CalPlug manager Arthur Zhang (back left) and Calit2 Irvine Director GP Li (back right) join CalPlug student researchers in show of team pride with a group Rip ‘Em Eaters hand sign. Team Orange will compete in the 2015 decathlon with other California teams including Stanford, Cal Poly San Luis Obispo, Cal State Sacramento and UC Davis, as well as teams from Yale, Clemson, State University of New York, University of Buffalo, Vanderbilt, West Virginia University, Missouri University of Science and Technology, University of Texas at Austin and eight others. Other speakers at the event included Wendell Brase, UCI’s vice chancellor for administrative and business services and chair of the UC-wide Climate Solutions Steering Group; City of Irvine Mayor Steven Choi; and Gregory Washington, Samueli engineering school dean. 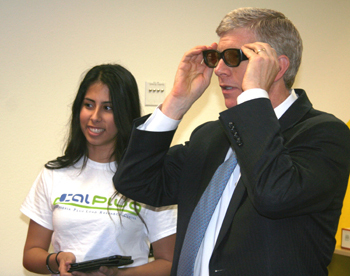 Deputy Secretary Poneman then spent some time touring the CalPlug Center at Calit2, talking with students, learning from Brase about UCI’s success at building clean labs, and touring the National Fuel Cell Research Center. 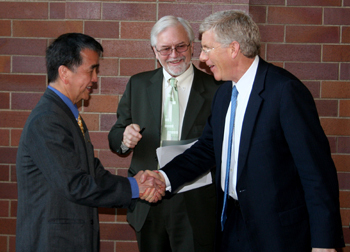 Li (left) meets Poneman before the presentation as Brase looks on. The deputy energy secretary viewed the CalPlug Wall of Power, an effort to deliver specific energy usage information to consumers through a secure delivery channel. “Will this turn off appliances when you reach a certain threshold?” he asked CalPlug manager Arthur Zhang, who replied in the negative. “My mother is nervous about that,” he said to laughter. Poneman also took the 1 Kilowatt Hour Challenge, designed to help consumers understand the energy usage of everyday appliances and electronics; viewed the ZotWatt 5W5s (five watts, five seconds) prototype entered in the Department of Energy’s MaxTech competition; and viewed the SIM lab, where students use sensors to anticipate humans’ habits and usage with electronic devices. than an ordinary hair dryer. 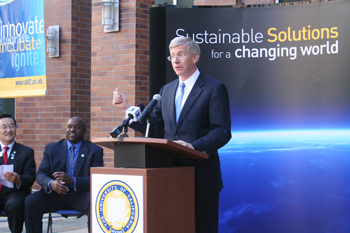 He then sat in on a presentation about UCI’s successful effort to reduce energy usage in campus laboratories. Brase said that labs typically are responsible for 2/3 of a campus’s total energy usage, but by using sensors and software to control ventilation, and measure occupancy and air quality on a space-by-space basis, UCI has dramatically reduced the amount of energy consumed in labs by 50-60 percent. He concluded his visit with a tour of the National Fuel Cell Research Center, where Prof. Scott Samuelsen shared a beta testing center for assessing fuel cells in different applications, as well as a fuel cell materials fabrication and testing lab. The deputy secretary then left the sun and blue sky of Orange County behind as he prepared to return to the snow, sleet and blizzard-like conditions of Washington, D.C.